"Have you ever sneaked a bite of raw Cookie Dough? No worries; we all have. It is pretty tasty, right? Well Taste of Nature, Inc found a way to create a raw Cookie Dough that is totally egg-free, safe to eat, and coated in delicious milk chocolate creating a super yummy treat. While Cookie Dough Bites we once only available in movie theaters, they are now found on the shelves of local groceries nationwide. So what are you waiting for? 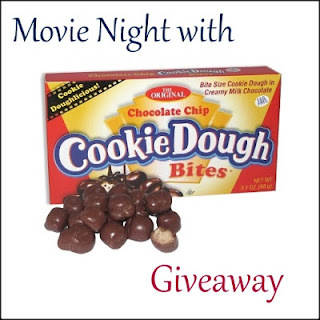 Grab a movie and a box of Cookie Dough Bites and create your own big screen moment at home." Four lucky readers will receive a case of Cookie Dough Bites + a Redbox movie on us. Giveaway ends March 22nd at 11:59pm, and is open to US residents, ages 18+. Special thanks to the co-host: Capri's Coupons. Dark Chocolate Chip sounds awesome. My daughter would love these.. This is the first I've seen them. I'd love to try the Cinnamon Buns bites. I would love to try Mint Chocolate Chip. I had never heard of them til I went to the website just now. I would love to try the peanut butter cookie dough bites! Yay! We can't wait to try these!